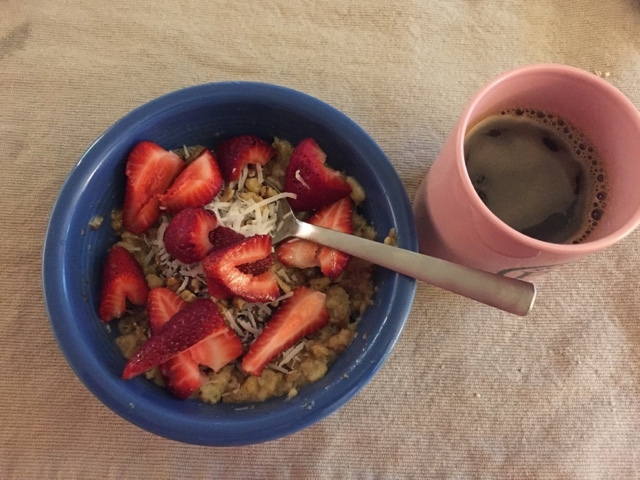 7:00 AM Faux-oatmeal with almond butter, unsweetened coconut, cinnamon, nutmeg, chia, walnuts and strawberries. Coffee. 12:00pm Leftover chicken and leftover balsamic glazed sweet potatoes and Brussels sprouts. Half an avocado. 6:00pm Half an avocado, more leftover chicken and a sweet potato that was roasted in the microwave. So easy! I'm so grateful for meal planning because this week some a lot came up and I've had a lot to do at work and after work. Today was a good meal of leftovers. 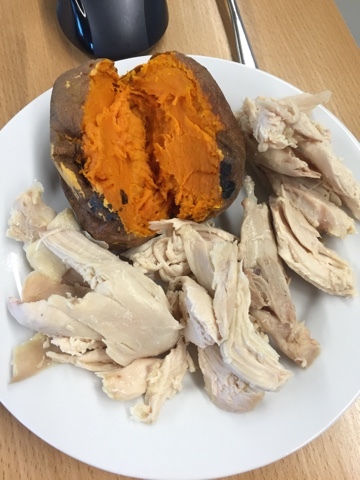 I had a lot of chicken and a lot of sweet potato which isn't totally ideal, but what I had on hand. I went to a new Bible study after work so I was able to bring extra chicken to eat and a sweet potato that I roasted in the microwave and ate plain. I need more greens! Overall I haven't had any crazy cravings and I'm glad I'm eating such nutritious food to fuel me through the next few crazy days.